Have you been trying to decide what kind of home security system to add to your property so you will be better able to protect your family and possessions? With so many companies to choose from, it can be a daunting prospect. 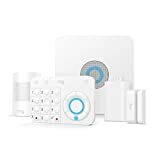 SimpliSafe is one of the most popular set-ups available and it’s easy to start, as you can find some of their products on the shelf at the home improvement center. Before you buy, let’s check some basic FAQs so you can make the best decision possible. You can always personalize your system and purchase additional sensors ala carte, but their packages get you up and running in just an hour or two. The SimpliSafe alarm that sounds from the base station is not as loud as it could be so it’s always recommended to add additional SimpliSafe auxillery alarms in areas far away from the base station. If you are going to monitor your home by yourself, SimpliSafe does not require a monthly fee in order for their equipment to function within the confines of your house. However, when nobody is home your unattended SimpliSafe system isn’t going to call the cops when a burglar breaks in. Their basic monitoring service starts at just $14.99 per month, but if you want to use your smartphone to access the system remotely, you will have to up the payment by $10/mo. The more gadgets you add to your system, the higher the fee will climb. If you wanted to add a CCTV and video recorder to your home security system, SimpliSafe alarm system is not going to be able to help you. You might end up installing a second system, with more monitoring fees to accomplish all the protection you want. Another drawback is that while they offer phone support to help you set up your system, nobody is going to come install it for you and verify its function before those monthly monitoring fees begin. There is no doubt that SimpliSafe appears to offer one of the most economical do-it-yourself systems on the market, but they can’t deliver all the equipment and services that a more experienced company like Protect America can. Before deciding to pull the trigger and purchase that box of sensors, remotes, and keypads, make sure that you are getting all the extras you really want. Protect America takes the time to discuss your specific needs and situation with you before deciding which pieces of equipment are best, which can end up saving you money in the long run as you won’t be upgrading your basic system that looked like a great deal at the time.